Are you under 16 and into cycling? Then Go-Ride is the place for you. Run by British Cycling, the sports governing body, it's a fun programme of activities and events designed with you in mind! Go-Ride is designed to introduce you to a range of cycling activities such as, Mountain Biking, BMX and Cycle Speedway. Astley & Tyldesley Cycling Club are the proud holders of the British Cycling Go-Ride Status and Sport England Clubmark Accreditation. You can be sure that the facilities and expertise available at the club will guarantee your experience to be safe, fun, exciting and challenging for everyone involved. 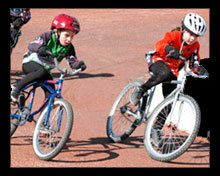 We have developed special sessions for youngsters wishing to try out Cycle Speedway. Practice sessions on Tuesdays at 5.30 pm for youngsters up to 10 years old and newcomers up to 13. The older and more accomplished young riders participate in the Intermediate group at 6.30 pm. For these sessions you can borrow a bike and helmet for just a £4.00 per session. The club has 45 bikes, all of different sizes to cater for all ages. Coaches - Mike Hack, Will Evans, Chaz Whalley, Mick Knowles and Mark Grantham. "If you want to improve your skills, you need to be taught by the best, and only British Cycling qualified coaches deliver the Go-Ride cycling activities"